It made me laugh when my sister and best friend came to NYC for a visit, and the first store they wanted to shop was Strawberry! Obviously I've been properly promoting the Berry here on FH (thanks for reading, guys). However, unattended by moi, they first visited a non-34th Street Strawberry and were disappointed. It was not a big, fun 34th Street Berry, but a small one without fabulous walls of flip-flops and sandals, and racks of tattoo-sleeves. Perfect for summer. As my friend said, the vest is "light, soft, and flowy." 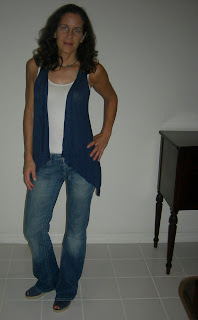 And I love how she's styled it with the tank, jeans, and espadrilles. I'd also like to give kudos to her talented, 7-year old photographer. Well done, little Demarchelier. Drapey vests are so interesting to me, they create such a non-standard silhouette. Excellent find!